I had other plans for today, friends, but the sales this morning…they’re just too, too good (for all of the codes, from Shopbop to J.Crew, check out my Facebook feed and its never-ending stream o’ deals). I thought I’d share a few of the many, many items lurking in my shopping cart this AM. This entry was posted in fall, sale and tagged alexander wang, elizabeth & james, erickson beamon, jerome dreyfuss, net-a-porter, rachel zoe, rag & bone, reed krakoff, shopbop, theory, tucker, vince, vivienne westwood on 10 December, 2012 by shoppingsmycardio. It’s a good day, my friends! 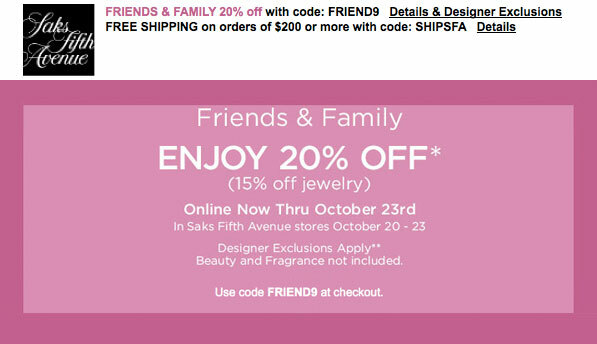 Welcome to the first day of Friends & Family at both Saks Fifth Ave. and Shopbop! Yep, you heard me. 20% off sitewide, with the obvious nagging designer exclusions. Friends and family is wonderful, but remember, it’s the precursor to the fall sales, when things will start at 25-30% off. So, like everything else in life, it’s a gamble. Take the sure thing now? Or wait until next week, when prices start to drop? It’s a judgment call, but generally, I suggest using Friends & Family to splurge on pieces that are classic, and therefore won’t go on sale – like, say, a Burberry trench. It’s also a great time for denim, as those markdowns won’t happen until much later in the season (if at all). And pieces you’ll wear to death now, like boots. But what I really want to know is…what are you buying?? 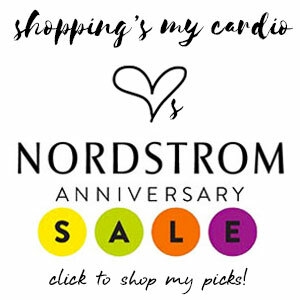 This entry was posted in coupons and discounts, deals, fall, fashion and tagged DVF, elizabeth & james, MiH, rag & bone, saks, shopbop, velvet, vince on 16 October, 2012 by shoppingsmycardio. 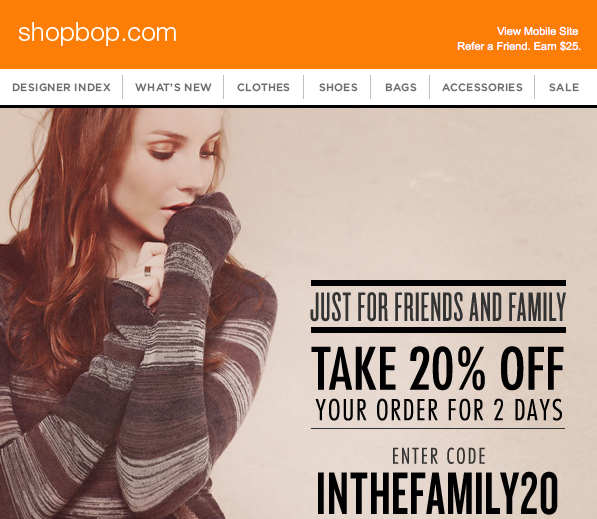 the F&F motherlode: shopbop and saks! Friends, I have two very exciting things to say to you. First, drumroll please…it’s Friends & Family time at Shopbop! 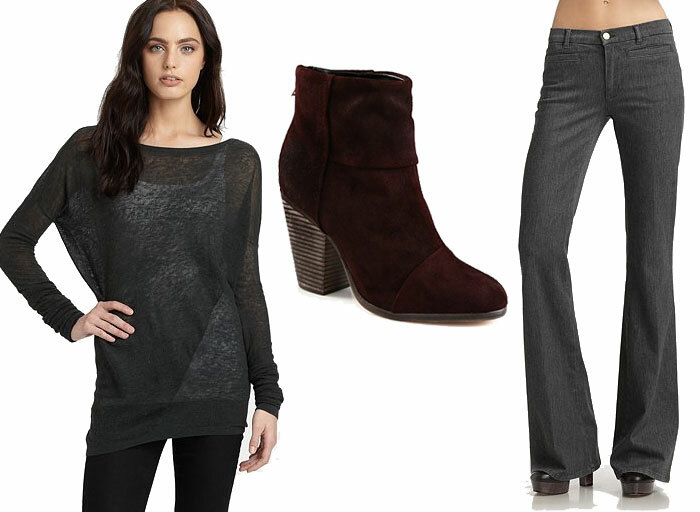 From Shopbop: Yarnz Chic scarf, $130; LNA knit pencil skirt, $95; Elizabeth & James booties, $350. 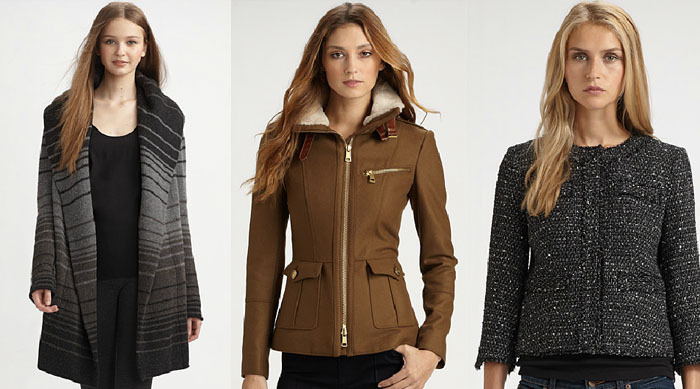 From Saks: Vince sweater coat, $395; Burberry shearling jacket, $1,195; Michael Kors cropped tweed jacket, $195. I know, I know. The Burberry jacket is a long shot. But hey, a girl’s got to have dreams! What’s on your shopping list? Whether it’s fantasy or reality, I’m dying to know! This entry was posted in coupons and discounts, deals, fall, fashion and tagged burberry, elizabeth & james, LNA, michael kors, saks fifth avenue, shopbop, vince, yarnz on 18 October, 2011 by shoppingsmycardio. I’m craving a great dress this fall. Something I can dress up or down, that will look amazing solo but has enough versatility to be styled a dozen different ways. I hadn’t seen anything that really fit the bill…until I spotted the Brijitte from Milly’s fall collection. Yes, that’s exactly what I had in mind. The big, bold print is strong enough to stand on its own (just leave that neckline open a bit, so there’s some skin to break up the pattern), but will be easy to mix into all sorts of styling options. And I’m so grateful to finally see a dress I love with a knee-length hem. For work, styling is simple. Loosen up the neckline, and pair it with a classic blazer with a perfectly nipped-in waist – something in black, navy, even chocolate brown is easy, but I’m feeling tweed for this look too. Keep the leg bare, or add an opaque tight and a great jewel-toned pump (suede if you have it). If you have a less conservative office, a heeled bootie would be amazing too. You don’t need much jewelry with the neck tie on this dress, but a classic gold hoop would be a perfect pairing. But then, of course, there’s the weekend…and the thing I love about this dress is its 24/7 appeal. Ditch the blazer and add a long cardigan or vest – oh how I love this herringbone vest from Elizabeth & James. You could even funk it up with one of the fur vests you’re seeing everywhere (I know, I know…but trust me – but the fur vests aren’t as scary once you try them on). Keep the ankle booties or try a riding boot* for a bolder choice. Push up the sleeves, add a long pendant necklace in gold (I’m thinking of that pretty chevron locket from Acanthus) or something bolder (perhaps from that amazing Elva Fields), and you’re ready for just about anything. *Speaking of beautiful riding boots, I have to take a moment to tell you about these. I’ve been wearing those very boots, the Frye Amelia in cognac, nonstop. I cannot get over how much I adore them. The fit is perfect (size down a half size), the color is so striking, and they’re ridiculously comfortable. Best new boot this season, if you ask me. How would you style this beautiful dress? This entry was posted in fall, fashion, styling and tagged elizabeth & james, elva fields, frye, milly on 27 September, 2011 by shoppingsmycardio. what i want today: mad for plaid! plaid was one of the hottest trends we found on the runways for fall. given the fact that nirvana and pearl jam were at the height of popularity when i was in high school, i am all too familiar with the plaid shirt grunge trend of the ’90s. as a rule, i think you should never re-visit a trend that you have already lived through…but, in this case, i think it might be worth taking a chance on a more refined version of the classic. while my plaid shirts in high school were, in fact, men’s shirts (often stolen from my dad or grandpa’s closets), the new generation of plaid boasts girly details like ruffles, feminine buttons and darts. i had my eye on the elizabeth and james bonfire shirt, but it is sold out everywhere! fortunately, there are still options that would be fun additions to your fall look – even better when the look comes at under $50. i love a trend you can try without a big commitment! i love the gathered waist and puffed sleeve details on fire’s plaid ruffle shirt (in red or purple). added bonus: the short sleeves make this a great transitional fall top. leave it to topshop, the UK-based fashion megaship, to pull off the plaid in a big way. this big check shirt in red has the look of the elizabeth and james shirt, without the price tag. sadly, it is missing the gorgeous back button details of the original, but you can’t beat the price (and they do ship to the states!). just remember: if you decide to rock the plaid this fall, leave the doc martens and smeared red lipstick (a la courtney love) at home! This entry was posted in fall, fashion and tagged elizabeth & james, plaid, topshop on 10 September, 2008 by jessie. shopping truth: after a promotional discount code shall quickly follow massive markdowns. case in point: both shopbop and saks have cut prices on all of their pre-fall pieces just days after their respective “shop and save” events. typical. the shopbop sale wasn’t thrilling me, but saks has me all aflutter. hurry over now to score this morning’s 40%+ markdowns on early fall pieces i’ve been dying to own, like this vince boyfriend cardigan i mentioned a few weeks ago, and this gorgeous quilted tory burch leather jacket. and the dresses…my god, the dresses. this robert rodriguez is an amazing classic, and a piece you can wear year-round. or this lovely DVF that’s making me oh-so-happy right now. i even love this elizabeth & james wilde vest jacket – so preppy, but so cool…and about 60% off, so it’s actually reasonably priced now! but move fast…the good pieces are going to be gone the moment i find my american express card! This entry was posted in deals, fall, fashion, sale and tagged elizabeth & james, robert rodriguez, saks fifth avenue, shopbop, tory burch, vince on 29 August, 2008 by shoppingsmycardio.